If you're a bird lover, you may have a variety of bird feeders situated where you can watch the songbirds happily filling their tummies. Unfortunately, pigeons with huge appetites will often join the party. As a result, the shy songbirds are intimidated and the ground beneath the feeders is a mess. Discouraging pigeons from the yummy treats in your bird feeders isn't easy, but it is possible to discourage the unwelcome marauders. Fill the bird feeder with black oil sunflower seeds. Songbirds love the seeds, which are nutritious and high in protein, but pigeons do not. Avoid bird seed mixes containing corn, oats, wheat and millet, which will attract pigeons. 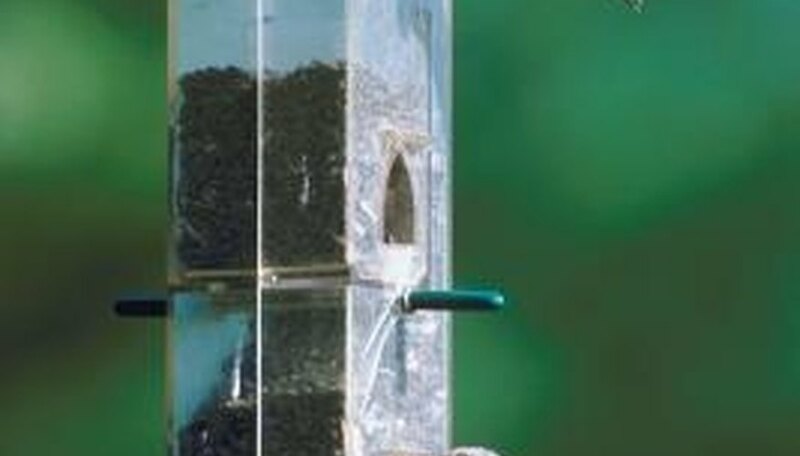 Use a bird feeder with short perches, or cut the existing perches down. Most small songbirds need a perch only about an inch long, but larger birds such as pigeons aren't able to hold on to anything that small. This won't completely discourage the pigeons --they can still eat the seeds that spill onto the ground -- but they won't get to the seeds before the songbirds. Encircle your bird feeder with chicken wire. Songbirds can easily fit through the mesh, but pigeons will not. Divert pigeons with their own feeding dish. Fill an old tray or pie pan with an inexpensive bird feed and set it at a site within sight of but away from the feeder. The pigeons will opt for the easier meal.